Microsoft OneNote is part of Office. You can download this free tool at http://www.onenote.com. But don't forget whether it isn't already at your computer because probably it is. OneNote is free and available for Windows and Mac, as software and webapp (via browser). OneNote can be used on a PC, smartphone and tablet (iOS, Android, Windows). Your data is anywhere anytime accessible. In this quick tips tutorial we'll explore some of OneNote's most interesting features. You can create a new document by selecting File > New. Choose OneDrive to save your file in the cloud. You'll need your Microsoft account. Choose Computer to save your file on your computer (local). Enter a filename and hit Create Notebook. You're now able to share this document with others. Choose Not now. By selecting File > Open you're able to open existing documents. OneNote offers the opportunity to structure your data. A document contains several sections (on top). Sections can be filled with pages (on the right). Every section will automatically have another color. This may take a while to get used to. Create new sections by hitting the + button on the top. Type in the name of the section in the tab. Double clicking the tab allows to rename the section. Hit the + button on the right to create pages. Add some pages to a section. By entering a title on the left you are automatically changing the name of the page. You're basically able to place text at all places. Click at your canvas and type in some text. The text boxes can be dragged and dropped anywhere. Below the title we added some dummy text (www.blindtextgenerator.com). You're able to copy texts from all kind of resources: MS Word, websites, etc. The source (url) will be automatically added at the bottom and linked to the referring website. Web addresses will be automatically converted to hyperlinks. Hit the tab Home on the top to format the text. Obviously this will allow you to emphasize text by putting it in bold, cursive, colors or different fonts. Via the tab Insert you're able to insert different kinds of objects: Word, Excel and Powerpoint document, audio and video. Hitting the Word- or Excel icon allows you to insert or attach files. Furthermore you're able to insert tables, or images and to scan. A very cool feature is the audio and video button which allows you to instantly record your voice. Few people are aware that OneNote will keep track of your activity while you are recording. So when your audience will play audio/video they will be able to see what you were doing while you recorded (writing, sketching, etc). OneNote is the pen's best friend. Go get yourself a stylus or even better: a Surface with a Pro pen. The purple button on top of the pen even automatically opens up OneNote. Hit the tab Draw. Choose your a color, size and start drawing using your mouse or pen. You're able to draw, write, gum or sketch. Via the tab History you're able to consult different versions of the document. All edits will be saved by date and you're able to switch back to an older version. Via the tab Review you're able to set a password to sections. Very interesting to be used in education where teachers can secure some sections. Select text and hit translate. Microsoft Translator will translate the selection to a preferred language. One of the most interesting features is the ability to share documents. This allows collaboration which is very important in education. Select File > Sharing. You can invite people by entering their email addresses. You are also able to get a link (edit or view) which can be shared with others. 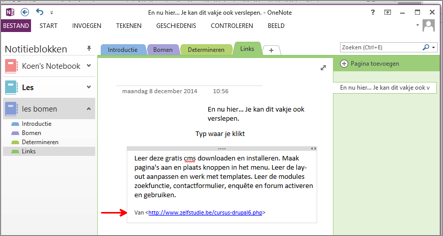 The invited people will get an email referring to the OneNote document (webapp). Allows to crop images and offers other images utilities, calendar, macro's etc. Office Lens: available for iPhone, Android en Windows Phone. One of the coolest features of the internet! Office Lens allows to take pictures via your smartphone, insert automatically in a OneNote document, Skew the image if needed and make the text editable, etc. Really awesome! This allows you to convert OneNote page or section in a Wordpress article. Allows teachers to create and share documents which students and take over control. OneNote allows to share, what offers a lot of opportunities. A teacher can share a textbook with his/her students. Students can share document with peers and collaborate in assignments. Collaborative learning is one of the best ways to gain knowledge. OneNote allows to record audio and video. Some students prefer to read, others to listen or watch a video. As a teacher you can record very fast some videos in case students are absent (ill, ...). You are able to work online, via webapp or software, on computer or mobile device. OneNote stimulates m-learning. Anytime, Anywhere learning. OneNote includes version control. Did a student erase a peer's work? No worries, a few clicks are sufficient to recover the student's work. OneNote is free. No distinction between haves and have nots. OneNote allows to take annotate. Digital ink is another elaborate story, but annotating offers a lot of interesting pedagogical perspectives: taking handwritten notes in digital textbooks, making schemes, brainstorming, drawing, replacing the chalkboard, correcting assessments, etc. By linking other documents, you are able to bundle a lot of resources. By securing sections a teacher can shield data from his students like personal feedback, schemes, agenda, etc. 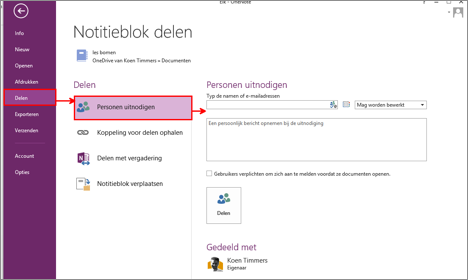 Last but not least: OneNote offers structure. A good teacher offers structure during his/her class. By structuring knowledge in document, sections and pages one is able to bring clarity in complicated matters. The search form allows to find subjects very fast. Try to find a specific word in a printed textbook containing 100 pages. Searching in OneNote works like charm. This list is incomplete and a result of a 15 minute brainstorm. I'm sure there are a lot of extra opportunities. Students can create assignments in OneNote, Teachers can instantly correct and offer feedback on the fly (using a pen). Did you know OneNote calculates, converts handwriting to text and has a wonderful search form on board which even searches images and handwriting? Discover 8 more functions in OneNote. Special thanks to Gene for sharing some screenshots.